Pallas Marketing fundraising shows offer a fantastic opportunity for exhibitors to showcase their products to our large audience. This is limited to 8 exhibitors per show to provide maximum return. Our events are extremely high profile and we provide an opportunity for eight exhibitors to set up stalls (like an Ideal Homes event). We work to ensure that the exhibitors receive maximum exposure and they either sell products at the event or they give vouchers to the audience to purchase later. Here is what a recent exhibitor had to say…. As an exhibitor, we found that there was a significant return on our investment. Between launch night, stands outside and during the event itself, we received great exposure & opportunities to target new customers. 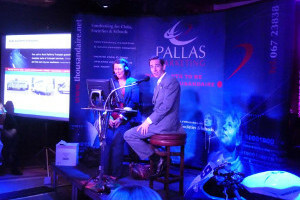 Pallas Marketing has been coaching organisations to fundraise professionally for the past fifteen years. We have raised more than €17 million to date. 2018 Pallas Marketing. All Rights Reserved.